These pages are dedicated to the support and continuation of a classic tripod design by two Italian brothers, first produced in 1946. The Tiltall design is presently owned and manufactured by Mr. Oliver Yang of Taipei, Taiwan. Some quick notes, first. Tiltall PARTS Order Info...continue to next page. Please review "honor" method before submitting your orders - and please include your address and telephone number. LINK to TILTALL BLOG - for further history, exploded drawings and answers to frequently asked questions about this classic tripod. You are welcome to ask further questions or clarification on earlier ones. Link here INQUIRY/ORDER Comments are closed on the individual posts, so please use this link. Tiltall Tripods are available in the USA from Adorama in NYC. In LA, Freestyle and Samy's. Occasionally from Calumet in Chicago and its various retail stores. Mr. Yang is also the maker of my Flash Ring for Plume Wafer lightbanks and the many other photo metal works by his company, King Home. "Italo Marchioni emigrated to the United States in the late 1800s, and although he lived in Hoboken, NJ for a time his fame resides solely in New York City. He began his business selling his homemade lemon ice from a single pushcart on Wall Street, but his business quickly grew into many carts. "Although he was successful he still had a small problem that was causing him to lose money. 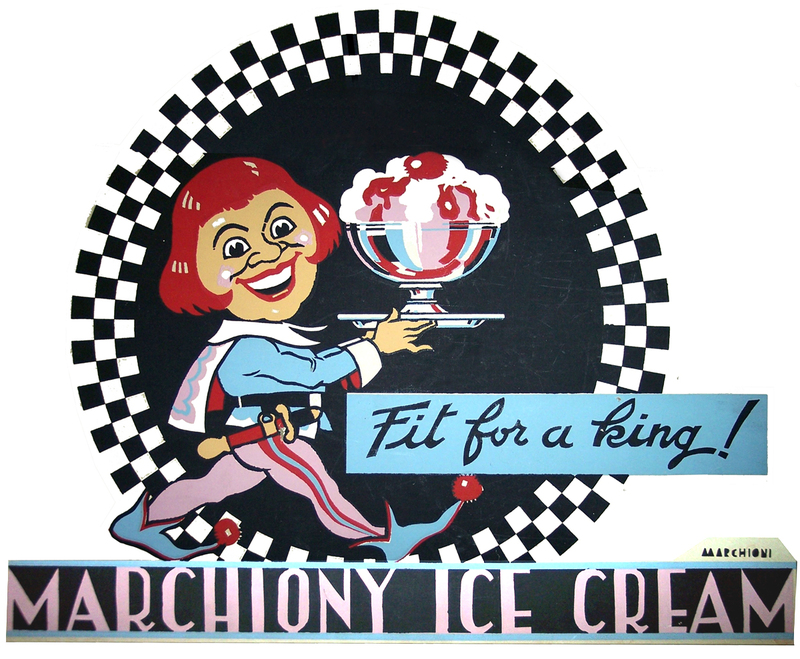 At the time, most ice cream from vendors was sold in serving glasses called "penny licks" (because you'd lick the ice cream from the glass, and it cost a penny to do so). There was a major problem with sanitation (or the lack thereof), but Marciony's problem was that many people would accidentally break the glasses, or not so accidentally walk off with them. His first solution was to make cone-like containers out of paper which worked fine until he was hit with a stroke of genius. He came up with the idea of making an edible container for his cool treat. So, in 1896 he began baking edible waffle cups with sloping sides and a flat bottom - shaped like his serving glass - and it was an instant hit. "On September 22, 1903, he filed a patent application out of the city and state of New York, and U.S. Patent No. 746971 was issued to him on December 15, 1903. So although he lived in Hoboken for a time, while selling his wares in the big city, and although my home town web sites claims him as our own, his patent clearly states that he is 'Italo Marciony of New York.'" From Bill Kellen - "Italo and Frank Marchioni were cousins (also spelled Marchiony). Both had a push cart ice cream businesses in New York City. My grandfather, Frank, had his ice cream shop on New Street where his sons [and future Tiltall designers], Caesar and Mark, worked along with their sisters, Florence and Margie, and two other brothers, John and Richard. My mother, Madeline, was too young to work in the shop. My grandfather's partner was Antonio Valvona who allegedly invented the ice cream cone (actually an edible cup). Their company was named Valvona-Marchiony Company." The sign, left above, hung over the ice cream shop of Frank Marchiony and family at 58-62 New Street, New York City, across the street from the Stock Exchange in 1940 - image courtesy of Bill Kellen - the first Tiltall tripod ships six years later. "As time passed and the Marchioni ice cream business grew, the two brothers, Caesar and Mark began pursuing their own personal interests in their free time away from the store. Caesar had been given a camera in 1918 and he spent much of his time taking and developing pictures, while Mark’s interest led him to a specialty in industrial design. 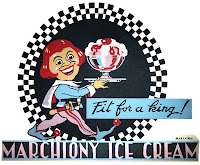 "Until the start of the depression, the Marchioni Ice Cream business flourished but, as many businesses felt the pinch of the depression year the Marchioni brothers began to search for ways to augment their dwindling business and incomes. As Caesar turned more and more toward photography, he became frustrated with his tripod which while relatively steady, was heavy and since it didn’t feature a tilting head, limited him to straight-on photographs. "Initially, Caesar and Mark turned their energies to developing a practical tripod head, one that would fit the cameras of the day and, most important, would allow the photographer to tilt the camera on the tripod and photograph his subjects from the best or more creative angles. They settled on a design, put what savings they had into a mini-machine shop and began manufacturing their unique product. "Door-to-door sales of this new product didn’t break any records during the depression, but it kept the brothers busy, and began to develop into a modest business when the outbreak of World War II brought the business to a halt due to lack of materials. The brothers turned their skills to the war effort, and subcontracted to build precision tool parts for divisions of Bendix for the duration of the war. The Tiltall Arrives - "After the war, the brothers decided the best thing they could do for their business was to produce the complete tripod, and not just the tiltable head. Tripods of the day could be divided into two main categories—the wooden ones, which were usually quite sturdy, but sometimes warped or dried and became brittle, or the metal tripods, which had a deserved flimsy reputation. "The two brothers began working on a design for a metal tripod: one that was solid, light, and could effectively maximize the versatile tilting head. In 1946, after considerable work, the first Tiltall was produced. The Tiltall Tradition - "From 1946 to 1973, the Tiltall production remained in the hands of the Marchioni brothers. Production was purposely limited to allow the brothers an opportunity to personally supervise and control all steps in the production cycle and assure a product of consistent quality. 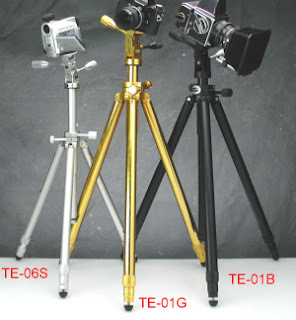 The files of the brothers are filled with letters of testimonial to the quality and superb performance of the Tiltall tripod demonstrating the success of this approach. Also, in spite of virtually no budget for advertising, Tiltall’s fame spread and the orders for new tripods far exceeded the brothers’ ability to produce them—even in the leanest years of our economy. Tiltall and Leitz - "Early in 1973, Gene Anderegg, from E. Leitz, Inc., in Rockleigh, New Jersey, who had known of the Tiltall for many years, contacted the Marchionis to discuss a possible affiliation. Leitz had an enviable reputation in the scientific world as the builder of the highest quality microscopes, and in the photographic world, as the creator of the famous Leica 35mm system of photography. "The Marchionis felt that the time was right to retire and had been searching for someone to carry on the tradition they had established with such great care. The result, the Leitz reputation was enough proof for the Marchionis and a deal was consummated. And so, the tripod works were moved from Rutherford, New Jersey, to Rockleigh, New Jersey, where the Marchionis personally trained the staff now carrying on the work that began because a loving father gave his son a camera." -here ends the Leitz' history. Bill Kellen continues- "As a young man I worked in their machine shop in Rutherford, NJ, and made the Tiltall Tripod. They gave my father, brother and I the last three tripods assembled off the line when they sold to Leitz. My father was chief photographer for Kaiser Industries. I also have in my possession the letters that photographers around the world sent to them praising the tripod." RELACEMENT PARTS and ORDER INFORMATION on next page.